How much Rietveld is Felix & Mumford? How much Rietveld is in anyone, who somehow came in contact with this school? I honestly doubt, that there is a real answer to this question. How much are artists influenced by their surrounding? By the people they meet every day? A lot!? At least they chose their professional field to react through their art on what is going on around them. But does a school situation really shape one more than everything that happens afterwards? One might be more open to other opinions of teachers and fellow students though. One might think more about: How much do we have to listen to others to develop? When do we change, when do we improve? Does an academy change us or are we changing the academy? Was the academy first there or the student? Felix & Mumford think spatial in everything they do; may it be fashion, may it be sculpture. Does this make them artists in the tradition of the architect Gerrit Rietveld? Trying to find a relation to the work of the Dutch artist couple Felix & Mumford and the Rietveld Academy, I can base this article only on my subjective perception of the educational artistic study programme and the cornerstones of the above mentioned. The duo consisting out of the Egyptian Gamal Eldin Fouad and the Dutch Claire Fons comment on what they see in the world, in the society around them. They seem to work from within, but as someone who walks around with open eyes. It appears, that it is especially the big cities- Berlin and Amsterdam, in which they live, which influence them. Cities in our times- that is where society happens. You can´t get closer to the people: truth and lies, misunderstandings and odd complications. It is an agglomeration of concept material. 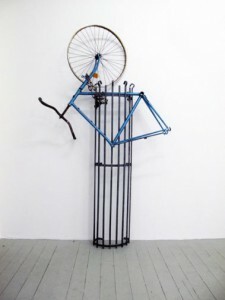 Felix & Mumford work critical and question conventions through the surprising use of well-known objects. Day-to-day experience ripped out of context, put in a gallery so that the sudden space around it would make people aware of what they tend to oversee. So what about this big idea, that art could be for everyone, that everyone should be able to comprehend it or- at least- relate to it in some way or another? Most of their work uses an ironic twist to pose a question based on the “treasures” the duo finds- looking and reflecting on what they see. In their choices, they might be too close to actual life, as that their art could be appreciated by non-art interested viewers. Nevertheless the artists play with the connotation of the Authentic and Honest. Their choice for materials shows a very “grounded” approach with objects and creative tools clearly recognizable from the “real world”, but manipulated (e.g. 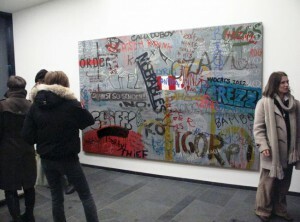 through a shift in context) to strengthen the artistic idea. The research and process part of a project are at least of equal importance as the final result, but don’t necessarily have to become a part of it in the exhibiting act. Fons and Fouad don’t create art for a purpose in the sense, that it would be a usable tool afterwards. The work functions as an attempt to understand and explain normalities and oddities likewise. In dealing with their questions, they do not seem to mind classical art genre borders. 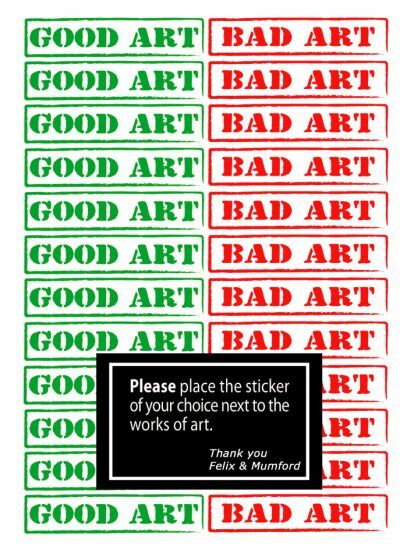 Felix & Mumford use various media to express their thoughts often including text material. This fact – the department overlapping working-might refer strongest to their Academy background. Their temporarily focus on language is probably due to Gamal Eldin Fouad, whose own work merely deals with text and who also taught creative writing at the Rietveld academy. Felix and Mumford aim for a clear visual language, with their art always featuring only but a few different elements. However their work somehow gives the feeling of a certain separation into two parts. While one part strives for poetic subtlety (referring for example to the video, that can be seen in Fashion & Foam at the moment), the style of the other part often refers to urban art and is a somehow more decorative and literal translation. A good example for this would be one of their last projects, called Sub Rosa. In this work they mapped the remaining graffiti tags around the Rosa Luxemburg Platz in Berlin to draw attention to the city´s restoration and polishing in the curse of the on-going gentrification of the Center. At the end of their somewhat archaeological search stands a painting, which assembles the separate writings to one big memorial piece. 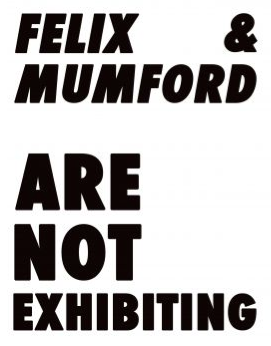 One could say Felix & Mumford fit the Rietveld style in their subjects and their execution, how much this is due to an education they followed is albeit hard to detect in a time where the human mind processes so many impression and various information every day.